A large crane being used to construct the new Tappan Zee Bridge collapsed Tuesday, blocking all lanes for hours on the span it is replacing, closing the traffic artery for hours and injuring four people. Most lanes were open for the Wednesday morning commute, but transportation officials were warning drivers to plan for extra delays after the boom of the crane toppled over into traffic Tuesday. No cars were hit in the mishap and there were no serious injuries. Five people sustained minor injuries. "Miraculously, there were no serious injuries," said New York Gov. Andrew Cuomo. "If you said to me that a boom could fall across the Tappan Zee Bridge at noon, not hit a car ... I would not believe it." Gov. Cuomo said the crane, being used in the construction of the new Tappan riverbede, was operating a vibratory hammer to drive pilings into the riversbed when it fell across the 90-foot, seven-lane width of the old bridge. State police said that at least one car was hit by debris, sparking a small wreck. Three people had injuries from a two-car fender-bender, and a worker on a barge suffered bruises. It was initially reported that a crane operator was thrown into the water as the machinery fell; Cuomo later said that that was not the case. Jeff Loughlin, business manager of Local 137 International Union of Operating Engineers, which represents the crane operator, said the operator has been tested for alcohol and drug use, which is routine. Loughlin said he has a clean safety record and has been a crane operator for more than 20 years. 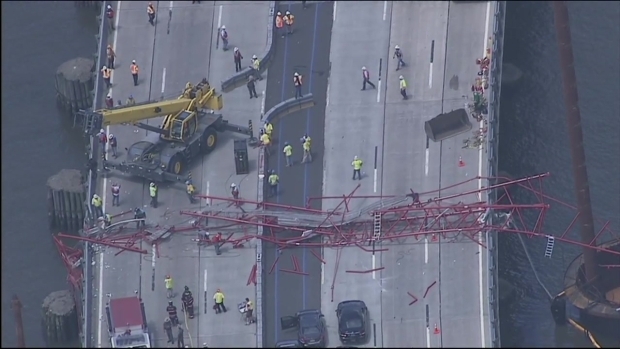 Chopper 4 over the scene showed the red splintered remains of the crane boom crashed atop two lanes of traffic on the bridge, with debris strewn all over the roadway. Part of the boom caved in an outer concrete barrier of the bridge. Footage from traffic cameras in the area showed severe traffic buildup. Truck driver Mike Matza recounts his very close call with the Tappan Zee Bridge crane collapse Tuesday, telling NBC 4 New York exclusively he slammed his brakes just in time. He also shares his dashboard camera footage and cellphone video from the collapse scene. Lori Bordonaro reports. Cuomo said Tuesday afternoon the machine was one of 28 cranes operating on the bridge. Officials said they do not believe the wind was a factor in the collapse and no cause has been determined. "We were very very fortunate the situation wasn't worse," Cuomo said. "This could've been a real tragedy and we could've had a real loss of life." Michael Matza was driving southbound on the bridge when the crane came down. He said it collapsed right in front of him. "One more second and I would've been under that crane," said Matza, who drives a truck across the span every day for work. "I was driving propane. I could only imagine what kind of mess that would've been." "You really don't have time to think," Matza, a married father of three kids, aged 15, 12 and 3, said. "Just looking around it's really amazing no one else got hurt." Nicholas D'Emealio, of Irvington, was in a vehicle about three football fields away from the crane, toward the center of the 3.1-mile-long bridge between Westchester and Rockland counties, when he heard a bang and his driver slammed on the brakes. Video shows a crane collapsed on the Tappan Zee Bridge Tuesday, causing officials to close the span to all traffic, officials said. The Tappan Zee Bridge crosses the Hudson River at one of its widest points and connects South Nyack and Tarrytown about 25 miles north of midtown Manhattan. The crossing carries about 138,000 vehicles per day and is vital to the trucking industry. The new Tappan Zee Bridge has been under construction for three years and is expected to be completed by 2018 at an expected cost of $3.9 billion. It is being built alongside the original, seven-lane Tappan Zee span, which dates to 1955. Cuomo said he didn't believe the collapse would affect the project's timetable. The bridge has been inspected three times since 2014, including two times that year, according to Tappan Zee Constructors, LLC. The inspections in 2014 stemmed from two serious violations relating to protecting workers from falling. One violation was settled and another was changed to "other than serious," the company says. An initial fine of $10,000 was reduced to $6,600 and the case was closed in June 2015. The third inspection was in response to a safety-related complaint in December 2014, the company said. No violations came from it and the case was closed.